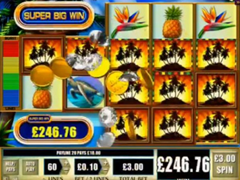 Fortunes of the Caribbean Pokie Review - Play today! If you dream of a Caribbean Island holiday, it time to pack in your dreams and sail of on a catamaran in the sunset with this pokie taking you to the high palms, the golden beaches and the lovely breeze of the ocean. This holiday could reward you with great riches from features that are not skimping on winning chances including wild, scatter, and free spin. Play your dream wins on 5 reels and 60 paylines developed by WMS with hours of fun waiting. The Jackpot offers a wonderful bonus 400 coins and you can really enjoy the game with low bets allowed from 0.01 to 5.00 every 2 lines with the maximum bet at 150.00 per spin. A blue ocean with a cloudless horizon and palm trees offers you the platform to unpack your dreams and roll magical wins on the reels. The reels are interestingly displayed with two reels of 2 rows and 3 reels of 4 rows ensuring this will be an interesting game with great winning opportunities. The symbols are colourful and bright confirming the Caribbean island lifestyle with the Strelitzia Reginae flower, healthy yellow bananas, turtle enjoying an ocean swim, pineapple with green leaves, Caribbean logo with silhouette of palm trees in rays of sunlight, island resident with flowers in her hair, string of white pearls, pendant with the blue of the ocean, parrot in colours of red green and blue, island frog with big red eyes and an orange fish swimming above amazing coloured coral. 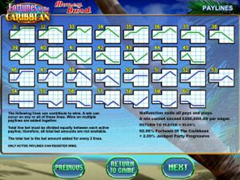 The wildcard symbol are displayed by the bright blue ocean and will be able to expand over the symbol within the reel it appear, the wilds will only come to show on the last 3 reels with the ability to trigger greater winnings when it forms part of a combinations, it will however not be able to trigger the free spins game by forming part of the scatter wins. The free spin game has many ways if being activated, the easiest way is to get 2 matching symbols on the first 2 reels, this rewards you with 5 free games, but you can also receive the same amount of free game by getting golden shell scatters on the last 3 reels, and if you want the biggest reward you will need to match up 2 symbols on the first 2 reels and get 3 of the scatters on the reels all at the same time, with this you will receive 20 free games. In the free games you will receive a wild symbol on either of the first 2 reels to be featured in every spin. Playing on such an exciting themed pokie always ignites energy and winning feels real with the bright symbols passing on the fast spinning reels. This game will entertain you for hours while your mind finds it easy to drift off on an island holiday of its own.